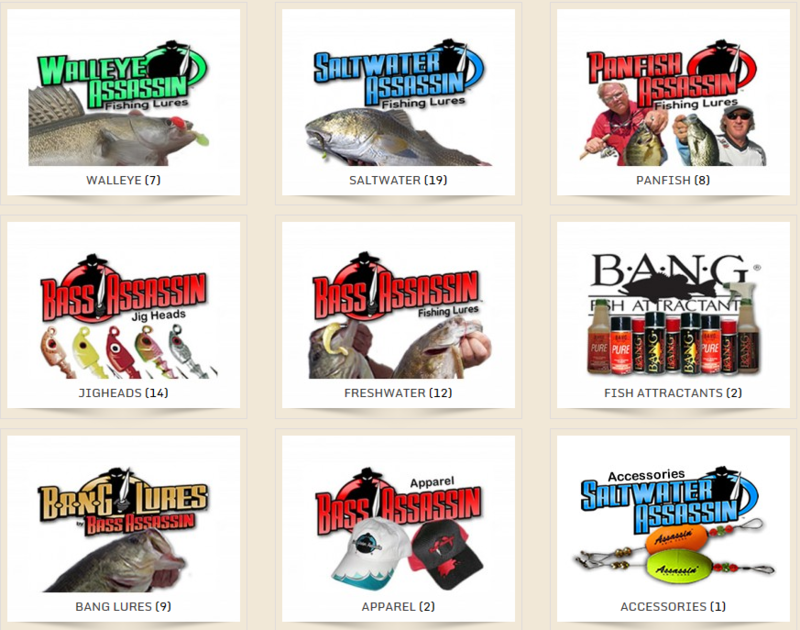 Why are more and more fisherman using or switching to BASS ASSASSIN Fishing Lures? Because of the unique designs that create such realistic action. It’s also the selection of fish-catching colors, including the unique 3-color molding process. It’s the added P-Enzyme Formula which gives Bass Assassin’s lures that extra attracting power. But most importantly - serious fishermen have found that even when other baits aren’t producing….Bass Assassin Lures Catch Fish! Whether you are fishing for largemouth, smallmouth, trout, salmon, you name it, Bass Assassin has a premium quality fishing lure for you. The new Elite Shiner Swim Bait is the perfect bait for bass and it also works wonders on other large game fish! (It’s also available for Saltwater and Walleye). They feature a medium sized paddle tail that gives it a superior tight wiggling action and is made of our super soft plastic. These are infused with the B.A.N.G. Scent Formula Attractant. The new Boss Shiner has been built to bring in the big fish! These swimbaits are designed to create a realistic and enticing action. They feature a ribbed body, which tapers down to a large paddle tail. The ribbed body will help create a better action, more water movement and help to produce bubbles in the water. The large tail is what helps make this look realistic while swimming back or falling down. The large size of the tail also helps create a fish catching action no matter what speed your retrieving at. Inshore or offshore, redfish, trout, snook, flounder, we have got you covered! The new Saltwater Elite Shiner Swim Bait features a medium sized paddle tail that gives it a superior tight wiggling action and is made of our super soft plastic. These are infused with the B.A.N.G. Scent Formula Attractant. Our Turbo Shads, Curly Shads and Split Tails are the right weapons for catching those big water walleyes! The new Walleye Elite Shiner Swim Bait is infused with the B.A.N.G. Scent Formula Attractant. Just like the Freshwater and Saltwater versions, it features a medium sized paddle tail that gives it a superior tight wiggling action and is made of our super soft plastic. Unbelievable action from such small bait. Life like movement in the water with a thumping tail that really kicks the water! It’s also one of the best kept secrets for inshore fishing! Enhanced with our BANG Fish Attractant and our new liquid salt impregnated in the plastic. Super soft, high quality lures. They will change the way you fish! Many different styles of brand New Jigheads at great prices!